Pies, lots of pies. Banoffee pie, and other pies of interest. This is my attempt to become the highest ranked page on google for a simple search on the word 'pies'. 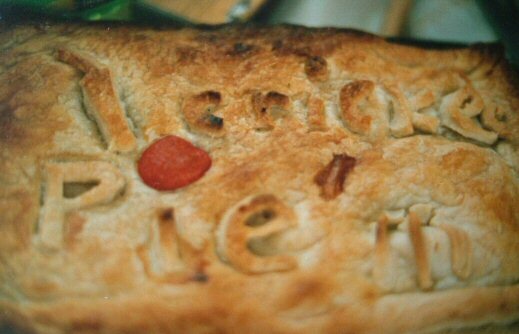 Please link to this page directly, ideally using the word 'pies' in your link text. In return, I'd be more than happy to link to anyone who does so, from this page. Pies. My recipe for banoffee pie follows. This takes about 3 hours to prepare, then about the same time in the fridge before consumption. This recipe will give 8-10 reasonably generous servings. Immerse the tins of condensed milk in a saucepan full of boiling water. Do Not Pierce The Tins. Do Not Let The Water Boil Away. They should be completely covered with water at all times, or the tins will probably explode. Funny, but only when it happens to someone else. They need to gently boil about 2.5-3 hours. Open hobnobs, and eat about half a packet. You probably shouldn't watch TV at this point, or not enough hobnobs will survive. Destroy the remaining biscuits however you prefer. My favoured method is to run them over with a steamroller, while laughing manically, but bashing them with a rolling pin in a jug works equally well. Add the crushed hobnobs to the butter, and mix evenly. Empty the butter/hobnob mix into a sensibly sized cake tin (ours is 9" round, and a couple of inches deep), smooth down, and put in the fridge. Watch TV for a couple of hours, and curse yourself for eating all the spare hobnobs earlier. If you're stuck for something to watch, I highly recommend a couple of eps of The West Wing, or any 70's kung fu movie. You should periodically move the tins of condensed milk around the pan, and keep the water level topped up. After they've been boiling for about 2.5 hours, remove the tins from the boiling water, and cool them under a tap. Carefully open them with a tin opener (you'll probably get some toffee goo burst out, but this will only hurt if you didn't cool the tins properly). Chop the bananas into this first layer of toffee goo. Empty the second tin onto the banana layer, and spread evenly. Whip the cream until peaks start to form. If you're sensible, you'll use an electric whisk thingy, or it'll take hours. Evenly spread the cream onto the pie. Finish off with a little grated chocolate, or some hot chocolate powder for decoration. Marvel at having made a pie that weighs over 2kg. Best not show anyone though, or they'll want some. Leave in the fridge for at least 2 hours to properly cool. For those of you not sensible enough to accept banoffee as the One True Pie, you might like to try Radiac's Apple Pie. Don't stick your knob in it though. Thanks to typo and Trapper for the pics.